The Friends of Bethlehem University in Ireland has appealed for financial support on behalf of the only Catholic university in the Holy Land which urgently needs major funding for a number of projects. 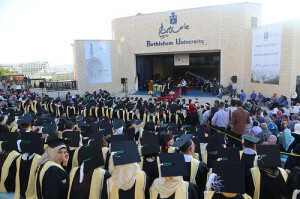 Founded in 1973, Bethlehem University has managed over four decades, with the dedication of the De La Salle Brothers, to bring education to the youth of Palestine and Gaza. Bethlehem is a Palestinian city of about 25,000 located in the central West Bank, about 10 kms south of Jerusalem. The town is surrounded by an 8 metre high wall so that mobility by the Palestinian staff and students of the university into or out of Bethlehem is very difficult, often impossible with closed Israeli checkpoints. Bethlehem has a Muslim majority, but is also home to one of the largest Palestinian Christian community. The town’s chief economic sector is tourism which peaks during the Christmas season when Christians make pilgrimage to the Church of the Nativity. 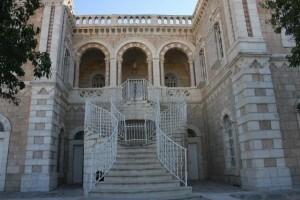 Bethlehem University has been described as an oasis of peace and tolerance in a troubled land. The university is a Catholic co-educational institution in the Lasallian tradition whose mission is to provide quality higher education to the people of Palestine of all creeds and nationalities, in the most difficult of political, academic, and financial circumstances. 61% of the students at the university are from the Bethlehem area; 30% are from Jerusalem and another 6% are from the Bethlehem District Refugee Camps. Given the harsh realities of everyday life in the Occupied Palestinian Territories and the on-going socio-political conflict, many students and their families have difficulty paying their University tuition and fees. The first university founded in the West Bank traces its roots to 1893 when the De La Salle Christian Brothers opened schools in Bethlehem, Jerusalem, Jaffa, Nazareth, Turkey, Lebanon, Jordan, and Egypt. Its top priority at the moment is the renovation of the library costing some €2.32 million, of which some €700,000 is still needed to complete that project. The Friends of Bethlehem University in Ireland (FBUI) hope to make a contribution to that amount. The mission of FBUI is to assist Bethlehem University by establishing an academic co-operation programme with the Irish university world and thereby to assist in the overall development of the international programmes of all the universities involved. Friends of Bethlehem University in Ireland was launched in February 2008 in Newman House, University College Dublin, by Dr Garret FitzGerald, who was then the Chancellor of the National University of Ireland, Nobel Laureate Dr John Hume, and Professor Robert Smith, the academic Registrar of Bethlehem University, with a supporting message from Dr Mary McAleese, who was then the President of Ireland.